A Colombia victory to cement their achievements? With all the furore over Luis Suarez and the attention that inevitably circulates around Lionel Messi and Neymar, it is all to easy to overlook the achievements of the South and Central American sides in this tournament. Of the ten nations from the two American federations that qualified for these finals, eight have made it through to the last sixteen. Only Honduras and Ecuador have fallen at the first hurdle. Whilst we would all have expected Brazil, Argentina and Uruguay to qualify, the feats of Mexico, Costa Rica, USA, Colombia and Chile have provided us with some of the highlights of this already spectacular world cup. When the draw was made it appeared that lady luck had deserted the USA. Drawn in a group with Germany, Portugal and Ghana, they were seen as the whipping boys in the one genuine group of death. However, they took advantage of being drawn to play Ghana (on paper their easiest game) in their first match and stunned the African side with an aggressive brand of football that yielded an early three points that proved so vital in a tight group. Their performance against Portugal merited a victory and it was fitting in the end that they qualified at the expense of Cristiano Ronaldo and his team. The USA manager Jurgen Klinsmann has achieved a minor miracle in whipping up public support for ‘soccer.’ The game against Portugal was the most viewed televised match in the country’s history with an estimated audience of 24.7 million. The squad is united under Klinsmann’s passionate approach to management and a second round tie with Belgium is not an insurmountable task. Chile’s performance in group B was viewed as a surprise by some. However, given the events of the last year it shouldn’t have been a surprise to anyone. Their performance last November in beating England 2-0 at Wembley in distinctly un-South American conditions was highly impressive and marked them down as potential dark horses. They were equally adept in disposing of world champions Spain in their second group match in one of the most committed team displays of the tournament so far. Their squad is young and the players are able to pound every blade of grass relentlessly. Spain and Australia simply could not cope with the energy of the Chilean players. However, a defeat to an under strength Dutch side in the final group game shows that genuinely quality sides can get themselves one step ahead. Brazil in the second round may be too much for Chile. With a population of just under 4 million, Costa Rica were by far the smallest and lowest ranked nation in Group B. However, they belied their lowly status by catching Uruguay cold in the first match. They followed that up in the second match by completely outhinking the Italians in one of the great tactical displays of the group stages. This was no plucky, lucky underdog story Instead the Ticos were superior to Italy in every area of the pitch. A nil-nil draw with England secured top spot in the group and provided us with one of the great world cup stories of recent times. Can you remember the last time that the fourth seeded team won their group? A last sixteen tie with Greece provides Costa Rica with a great chance of making the quarter finals. Mexico have been a joy to watch from the word go. in the first match against Cameroon they were denied two first half goals in controversial circumstances yet they maintained their discipline and eventually earned a 1-0 victory. Against Brazil, goalkeeper Guillermo Ochoa produced one of the finest displays by a stopper in a world cup finals match. One particular save from a Neymar header drew comparisons with Gordon Banks’ block to deny Pele in 1970 and is undoubtedly the save of the tournament so far. Mexico were far too good for Croatia in the winner takes all final group match and the joy of manager Miguel Herrera as his team scored three second half goals was one of the most priceless images of the tournament. Mexico have been solid in all three of their games, Ivan Perisic’s late consolation goal for Croatia was the only goal Ochoa conceded in the group stages. They have the joint best defensive record in the tournament with Costa Rica thought they will be severely tested by the firepower of the Netherlands in the second round. Finally, Colombia have been the most impressive of the American outfits so far. Shorn of their best player Radamel Falcao on the eve of the tournament, they have still managed to blow aside all three of their Group C opponents. James Rodriguez and Jackson Martinez have struck up an impressive partnership up front that has seen the pair score five of their team’s nine goals between them. Rodriguez’s goal against Japan in Colombia’s final match was one of the goals of the tournament so far however, the 4-1 victory will be remembered for the wonderful moment when 43 year old goalkeeper Faryd Mondragon was brought on as a substitute and subsequently broke Roger Milla’s record as the oldest player to appear in a world cup match. It was a gesture that epitomised the spirit of the Colombian team at this moment in time. They play Uruguay in the second round. The Uruguayans will be without Luis Suarez who has rightly been hit with a four month worldwide ban for his bite on Giorgio Chiellini. The reaction of the Uruguayan camp in the aftermath of Suarez’s latest indiscretion has been unsavoury at best. The circus surrounding Suarez has unfairly distracted from the achievements of all the South American sides, including Brazil and Argentina. To a man they have shown a commitment to entertaining and virtuoso football (Uruguay excepted) and they have each embodied the spirit of this sensational competition. It would therefore, be a fitting and poetic moment if Colombia were to dispatch Uruguay in the second round not just for the American teams but for the tournament itself. Look no further than Lionel Messi, though as the Barcelona forward has spent the majority of his life in Catalonia, many fans of La Albicelesteprefer the more workaday talents of the much-missed Carlos Tevez. But when the coach Alejandro Sabella says: “Messi is irreplaceable” he’s telling you nothing you don’t already know. Javier Mascherano has enlivened up many a European night with his poor behaviour, but his finest hour is surely a red card for kicking a medic during a match with Ecuador recently. Small and balding, Sabella has come a long way from the Osmonds lookalike who turned up at Sheffield United in the late 1970s. But hold your Crazy Horses, he has won titles at River Plate and Estudiantes, and won the 2009 Copa Libertadores. When Daniel Passarella was national manager, Sabella was part of his staff and followed him to Parma, the Uruguay side, Monterrey and Corinthians. A lightweight midfielder, he was popular at Bramall Lane but less so at his next side, Leeds United. He played in relegation seasons at both clubs. The rivalry with neighbours Brazil is rather special. In 1920, Brazil fielded only seven players in protest at a critical article in an Argentinian newspaper. Argentina followed suit by dropping four of their XI, then beating their opponents 3-1. In 1939, Argentina walked off in dispute over a last-minute penalty, leaving Brazil to score the winner into an empty net. In 1946, a barrage of kicks and punches resulted in broken legs and a police baton charge. The teams cooled off by avoiding each other for 10 years. Argentina will rest up at Cidade do Galo, Atlético Mineiro’s training grounds in Belo Horizonte. It’s a choice that betrays Sabella’s superstition: he won the 2009 Copa Libertadores in the city when his Estudiantes side beat the local team Cruzeiro. After stuttering start, including first-ever defeat to Venezuela, hit their stride to win 14 qualifiers straight and top the South American qualifying group. Although Maradona in 1986 was obviously great, the 1978 win on home soil, with the country in crisis, had even more resonance. Getting tonked 6-1 by Czechoslovakia in Sweden 1958 and going out at the first hurdle. Pablo Zabaleta (Manchester City), Erik Lamela (Tottenham Hotspur), Sergio Agüero (Manchester City), Fabricio Coloccini (Newcastle United). Passionate Latins, silky skills, accomplished cheats, diminutive powerful little hustlers with fantastic technique. Gifted but prone to rather limp displays at recent World Cups; tactics basically amount to “give it to Leo”. Messi, Sergio Agüero, Gonzalo Higuaín and Angel di María are all practically undroppable, so Argentina have little option but to attack. A lot of responsibility rests on the shoulders of the holding midfielder Mascherano, and on coach Sabella, who must do what Diego Maradona couldn’t do in 2010, and ensure his team keep a little shape – and their heads. 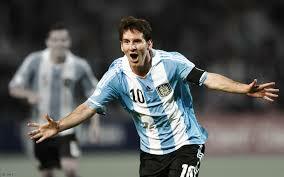 He also stresses that Argentina cannot rely on Messi alone. Mars himself seems to encourage. Greatness nestles on her breasts. Official version described as “excessively long”. Radio edit is one minute six seconds. 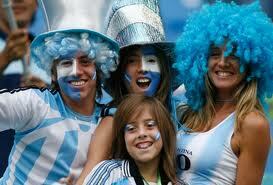 Be an attractive woman in a tight football T-shirt, wear a Diego mask or get a blue and white top hat. Argentina has the highest number of psychiatrists per capita of anywhere in the world. Most of them work exclusively on Maradona. THE WORLD CUP HAS STARTED! Colombia and The Netherlands have passed their biggest tests so far. Portugal out, and one man in particular has played a major role. In the name of decency, can someone please sanction Gaston Ramirez?